The May Fair Hotel is in the Heart of Londons West End. This plush hotel, opened by King George V in 1927, is an 11-minute walk from the boutiques and art auctions on Bond Street. Weddings at the May Fair are held in the beautiful Crystal Ballroom given its name from the Baccarat crystal chandelier, the room had bronzed and lacquered walls which give the room a moody seductive quality which was perfect for Amanda & Tony's November Wedding. The room was decorated with Red Roses and Black Crystal centrepieces which tied in with the Crystal elegance of the room. Amanda wore a full length lace mermaid style dress with long lace sleeves. Tony wore a black tux which set the tone of the evening perfectly. 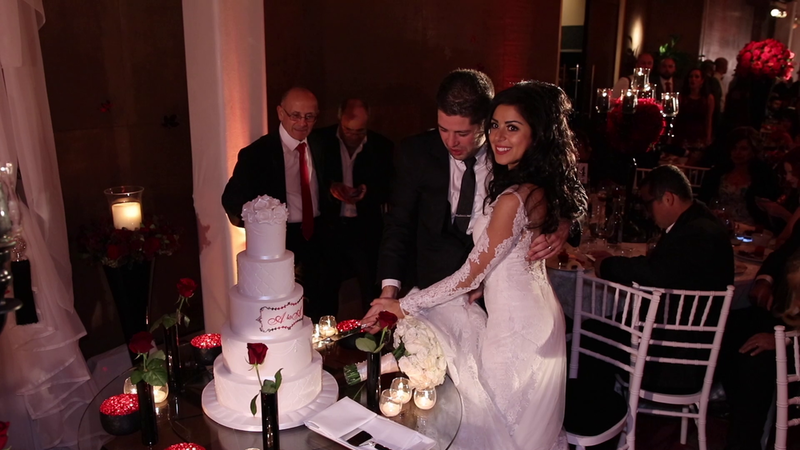 Amanda is of Lebanese heritage and Tony Greek so the wedding had elements of both cultures. Amanda had a traditional Lebanese Zaffe entrance and Tony had traditional Cretan music. Urban Cinematography have had a long standing relationship with Weddings at the May Fair, it was extra special in that Tony & Amanda are a couple who also have a personal relationship with the Hotel, Tony's Brother Andreas is the Events Manager and organised the Wedding alongside the couple. Andreas and his team work tirelessly to make every wedding that extra bit special and Tony & Amanda's wedding was a prime example of the commitment and dedication by the May Fair Team. Urban Cinematography hope that Tony & Amanda have a lifetime of love and Happiness.